Take the train to Cuxhaven, and then take the ferry to Neuwerk. The ferry starts at the "Alte Liebe" port which is located in a distance of approx. 1.5 km from the railway station. Take a cab or do a little walk. Take the highway A29 from Bremen to Cuxhaven. There is a large parking ground located directly at the "Alte Liebe" port which costs a fee of 4 Euros per 24 hours (status: 2013). Park your car here and take the ferry to Neuwerk. Neuwerk Island is located at the most south-west of the Elbe mouth in the North Sea tidelands, approximately 13 km northwest of Cuxhaven. The island is just 3 square km large. Politically the island belongs to Hamburg, even though it's located in a distance of more than 100 km from there. Together with its "sister islands" Scharhörn and Nigehörn Neuwerk is establishing to the Hamburg district "Neuwerk" in the "Mitte" region. The entire area establishes the National Park Hamburgisches Wattenmeer. It's possible to circle the island by foot during approx. one hour. The massive lighthouse from the 14th century is the landmark which is visible already from a distance. It was finished in 1310, and it wasn't just a balefire but also a protection from buccaneers. Finished in 1310, hence the Neuwerk lighthouse is the oldest building of Hamburg. It can be climbed for a fee of 1 Euro (status: 2013). A viewing platform which is located directly above the bonfire offers a beautiful view over the entire island as well as the onshore land. Nowadays there's a little hotel (7 chambers) inside the light house which offers a very special accomodation experience. Nearby one finds the "graveyard of the nameless". Formerly dead bodies which were washed ashore (usually castaways) were buried here. Nowadays dead bodies which are probably washed ashore are transferred to the continent. The island is completely diked, but outside the levee there are large plains with salt marshes (the so-called "Outland"). The outland is serving as a hatchery for many kinds of seafowls (oystercatchers, scrays, sandwich terns, black-headed gulls, herring gulls and way more) and in parts during the summer as pasture for cows and horses (Northern outland). During the summer the island is accessible once a day by ship from the "Alte Liebe" port in Cuxhaven. The island can be reached by ship during high tide only, thus the departure times are variable and depend on the tides. Over the entire year the island is furthermore accessible by so-called "mud flat coaches" as well as by horse or by foot, starting in the Cuxhaven districts Duhnen or Sahlenburg (during low tide). Starting in Neuwerk it's possible to visit the "bird island" Scharhörn. This island is accessible by a walk over the mud flat which takes approx. 2 hours. Important: the visit MUST be agreed by the bird keeper who is usually living there. This guy will tell you the exact time to start walking (this is important, due to the tides). At the german coastline it's common to eat fish. And one of the best restaurants can be found in a striking distance to the "Alte Liebe" port (this is where the ferry to Neuwerk starts): "Franke's Seestern am Steubenhöft". All dishes are prepared freshly, the service is perfect, the washrooms are really clean. Alltogether a nice tipp for anyone who loves fish. The old fishing harbor in Cuxhaven is still "alive" - there are fishing and shrimp boats which are unloaded regularly. The historic buildings of the old harbour invite their visitors to walk around and view. Get the freshest fish and/or North Sea shrimps by buying directly from the boats, e. g. herring, plaice or codfish. This 5-star hotel has spacious rooms and suites, 3 restaurants and a spa with top-floor swimming pool. It stands directly on the beach in Duhnen, a 10-minute drive from Cuxhaven. The Hotel Wernerwald offers large rooms and a daily breakfast buffet. It is located in the Sahlenburg district of Cuxhaven, just a 2-minute walk from the beach. The rooms at the 4-star Wernerwald have a modern bathroom and cable TV channels. 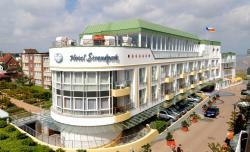 This 4-star hotel is directly located on the sandy Duhnen Beach Promenade, a 15-minute drive from Cuxhaven town centre. It features a heated indoor pool and a roof terrace with North Sea views.